You know a situation can't be good when one side brings in K-pop. Most people might not be aware, but the genre's aggravation potential is colossal. 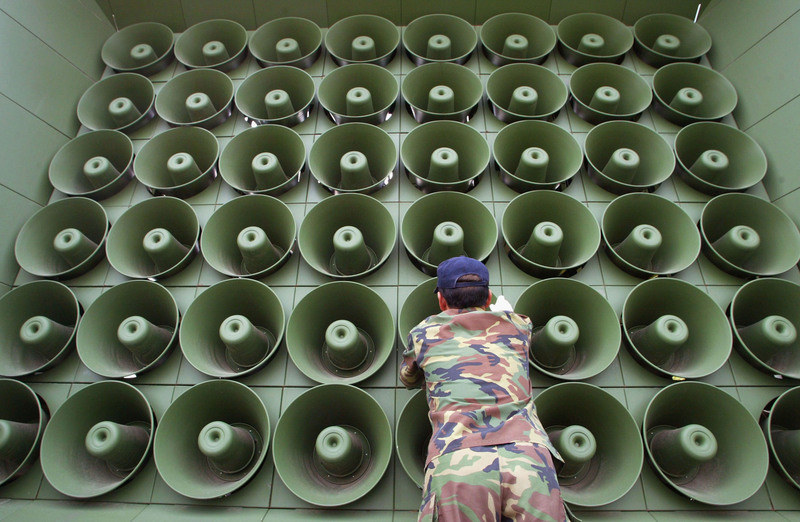 So the fact that South Korea blasted K-pop at North Korea through its loudspeakers for about two weeks is a strong indication of how close they came to war. After two of its soldiers were injured by landmines allegedly planted by North Korea, South Korea started blasting both anti-North propaganda and (in a clear showing of aggression) K-pop over loudspeakers, demanding an apology from Pyongyang. On Monday, the notoriously stubborn North Korea finally acquiesced in exchange for silence — proof of the effectiveness of weaponized K-pop. We need a clear apology and measures to prevent a recurrence of these provocations and tense situations. Otherwise, this government will take appropriate steps and continue loudspeaker broadcasts. At around 2 a.m. local time, during intense marathon talks, South Korea announced that it would cease its loudspeaker broadcasts at noon. The announcement came after North Korea reportedly expressed regret for the landmines, which seriously wounded two South Korean soldiers on August 4 in the Demilitarized Zone along the border between the two countries — the incident which kicked off the month-long tensions. Initially, North Korea had refused to take responsibility for the landmines, prompting South Korea to begin blasting its loudspeakers in retaliation. The ongoing conflict even led both countries to trade artillery fire last Thursday, forcing North Korea to declare a "quasi-state of war" and threaten further military action unless South Korea turned off their loudspeakers by a certain deadline. Instead of meeting North Korea's demands, South Korea continued its audio assault, battling Pyongyang's artillery, submarines, troops, and invasion vehicles with one very dangerous secret weapon. Over the course of history, man has learned to weaponize a vast array of substances, from gunpowder to disease-carrying insects. But never have we seen anything with such maddening qualities. South Korea's use of K-pop could change warfare and history as we know it. Not to be sadistic, but I'm going to have to expose you to some examples for you to truly understand. Listening to it once is already a tall order for some, but imagine listening to it on repeat, and at an earth-shattering volume. Not even the world's most despotic ruler could withstand such an onslaught. And that's just one example. While it's unclear what other songs South Korea hurled at the north, here are some that would be equally devastating. Actually, on second thought, perhaps the real reason North Korea crumbled when faced with South Korea's K-pop assault was not because these unreasonably catchy songs were destroying the people's spirits, but because they were breathing some life into them. Playing these ditties on repeat might have turned the totalitarian state into a nonstop party, and Kim Jong-un's not about to let that happen.